At the end of my last post I mentioned that the Bowling to Glasgow walk was only the first of three and that I might write about the others when their 25 year anniversaries came around. But since I probably won’t remember to do that (the dates of the other two walks aren’t so deeply emblazoned onto my brain as the first is), and since I quite enjoyed writing the last post and a few people seemed to enjoy reading it, I decided to just write the next one now instead. I think it was towards the end of our first walk that someone (probably Chris) mentioned the possibility of doing the rest of the canal at a later date. I was all in favour of this, of course, even though Chris hadn’t enjoyed the rest of the canal as much as the Bowling to Glasgow section when she and Ian had walked it before (she’d said that the middle section was quite long and boring, and by the time they reached the Falkirk end she was tired and just wanted to go home). 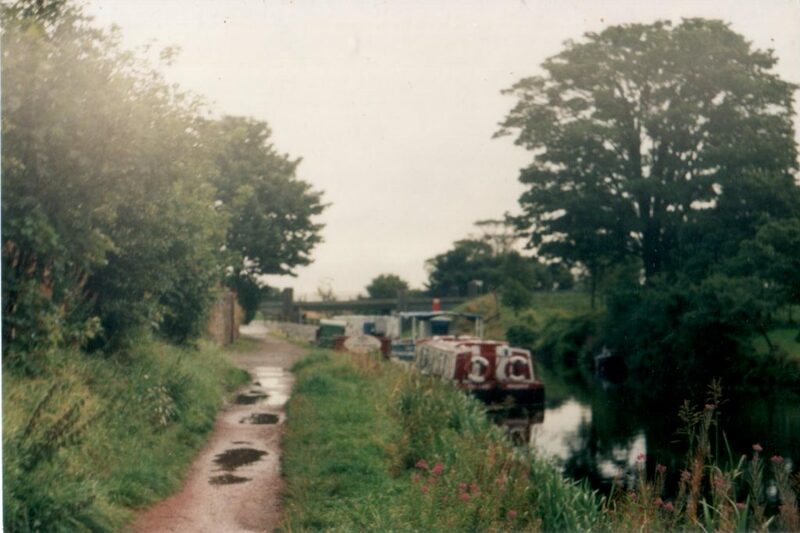 It took us a while to get around to arranging the next part, and in the end it wasn’t until September of 1994 that we returned to the Forth and Clyde Canal. Ian and Chris had walked the whole remainder of the canal in one go, a total distance of about 25 miles and more than double the length of our first walk! This time we weren’t being quite so ambitious and our plan was just to walk eastwards from Glasgow until we’d had enough, whenever that turned out to be. Apparently there were a few places along the way that were handy for public transport, so this seemed a good plan. This walk was going to be different from the first in several ways. For one thing we wouldn’t have a dog with us: Ben had a bad toe and couldn’t manage such a long walk, so he was being left with my parents for the day. We wouldn’t have a car either; Ian and Chris’s was off the road so we would be completely reliant on buses and trains to get us to and from the canal. And I’d been researching the canal and poring over maps since our first walk, so I had a much better idea of what to expect this time. (You might also be wondering why so few photos compared to last time. Well, my camera was still broken so I was borrowing my mum’s SLR, but I found it so complicated to use that I only ended up taking four photos all day, and two of those were identical ones of Firhill Bridge because I was worried the first one hadn’t worked properly!). The day of the walk dawned, and Ian and Chris arrived bright and early to drop Ben off and pick me up. Ever the master of optimism and motivation, Ian’s first words to me were “You know, it’s highly unlikely that we’ll actually make it all the way today”. I showed him the Dextrosol tablets I was bringing to try and boost my energy, but he just said “Those’ll be handy if anyone suddenly starts suffering from low blood sugar levels”. The weather was looking pretty good as we walked to the bus stop, and I could feel the mounting sense of excitement that could only mean I was off to explore somewhere interesting. The Glasgow bus was just pulling up at the stop as we turned the corner and we had to run for it. Thankfully we made it, and Chris and I found three seats together up at the back while Ian paid for the tickets. The journey through was uneventful and we talked about how much better for the environment it was to get the bus rather than driving through as we had done for our first walk. When we got to Glasgow the weather was still so nice that we decided to walk up the Glasgow branch of the canal instead of getting the bus up to Maryhill as we’d originally planned. After all, what’s an extra two miles on a walk that long? It meant that we were rejoining the canal at exactly the point we’d left it 8 months earlier, which made for some nice continuity, though it looked very different on a sunny morning from how it had on that cold November night. Eagerly we set off along the towpath, looking forward to a good day’s walking. I enjoyed seeing the Glasgow branch again, but of course I was most looking forward to seeing some new canal. We diverged from our previous path at Stockingfield Junction, where we had to go down and through a tiny tunnel-like aqueduct beneath the canal, then up a bank to get to the towpath on the mainline to the east. Although we were still very much in Glasgow, this part of the walk had a pleasantly rural feel to it, especially with the blackberries we were able to pick from some nearby brambles to keep us going. Chris pointed at a funny looking brick tower over to the north and said “I wonder what that is?”. None of us knew, but from looking at maps since I think it was probably the chimney of the nearby crematorium. Unlike most of the Bowling to Glasgow section, the canal we were now following had recently been reopened, so the bridges were mostly high enough for boats to sail beneath, and for us to walk under. The first one was an old metal bridge at Lambhill, and just beyond it was an original canal stables block as well as some weird underground tunnel entrances (both of which I would probably have tried to get inside if I’d been a bit older). The houses to the north gave way to open countryside and there was a little picnic area by the nature reserve at Possil Loch. We decided to stop there for a snack. Chris shared out some biscuits she had made and I took a swig from my large bottle of Irn Bru (a must for walking, in my opinion). While we were having our break, something unexpected happened: it started raining. I suppose we shouldn’t have been surprised, we were still in the west of Scotland after all, no matter how nice it had looked first thing. I put my jacket on and sheltered the biscuits underneath while Ian and Chris struggled into their waterproof trousers. Chris was amused that my first impulse had been to save the biscuits from getting wet, but said she would have done the same. There didn’t seem much point sitting around in the rain so we decided we might as well walk on. This walk certainly had quite a different feel from the previous one. The Bowling to Glasgow stretch of canal had had a constant succession of bridges, locks and other canal features to look at, not to mention all the buildings of the surrounding town. On our second walk we didn’t pass a single lock (we were entirely on the canal’s “summit” reach), the bridges were much more spaced out (more than a mile between the ones at Lambhill and Bishopbriggs) and the surroundings were far more rural (currently we had a golf course to the south of us and open country to the north). But I wasn’t sure I agreed with Chris’s comment that it was actually boring; it was certainly quiet and peaceful, but I was enjoying the tranquillity and found some of the countryside quite pretty. 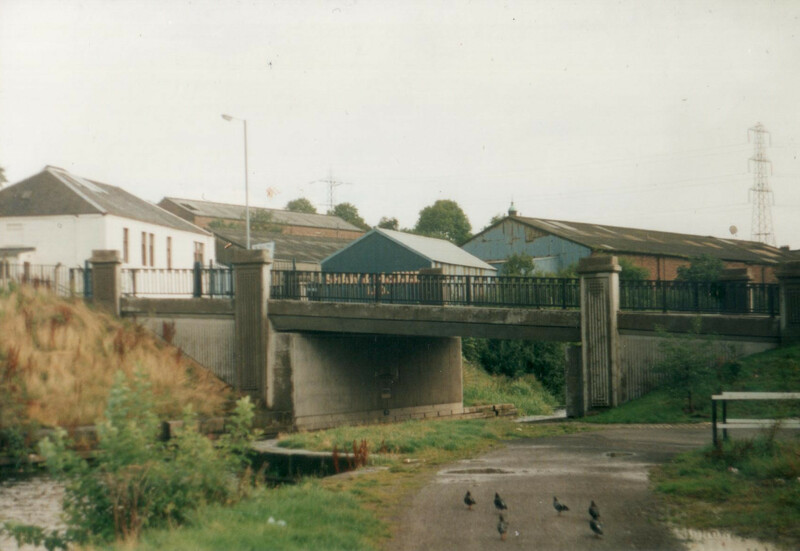 The next bridge was Farm Bridge, next to the Leisuredrome at Bishopbriggs. This was a slightly notorious bridge because it was only about 5 or 6 feet above the water which meant that bigger boats couldn’t go underneath it. It was supposed to be raised in the early 90s but the Glasgow Canal Project, which rebuilt all the other low bridges and culverts between Glasgow and Kirkintilloch, ran out of money before it got to Farm Bridge, leaving this annoying obstruction in the way. (Now, of course, it’s been replaced by the Millennium Link project along with all the other low bridges on the canal, and the new one has the full 10ft headroom). But low bridge or no low bridge, I was glad to see that (a) there were trees by the canal after the bridge which would give us some shelter, and (b) the rain was easing off a bit anyway by this time. I found myself looking enviously at Ian and Chris’s waterproof trousers as I felt my own soaked trousers against my legs and made a mental note to definitely get some of my own before I next did a long walk. The next little stretch, through the trees past Cadder, turned out to be really pretty. As the canal turned a corner, we climbed up onto a wooded bank and looked down over the valley (and yet more golf courses) below. The River Kelvin was down there, looking a lot smaller than it had been where we’d crossed it on the aqueduct at Maryhill the previous year. Apparently the bank we were standing on was probably part of the Antonine Wall. People think of the road building programmes of the 1960s and 70s as being pretty destructive as they bulldozed old buildings out of their path (and blocked canals), but things weren’t actually much better back in the canal age – the canal was cut right through the Antonine Wall here, and the navvies even quarried a nearby Roman fort to get stone to line the banks! There were a couple more bridges to pass before we reached Kirkintilloch where we planned to stop for lunch. The second of these was quite interesting because it had recently been replaced with a modern concrete one so that boats could get under it again, and there were quite a few boats moored nearby. There was also a pub in a converted canal stables block (called, imaginatively enough, The Stables). I took a photo but it came out blurry unfortunately. The rain kept going on and off, so at least it wasn’t raining constantly, but it never stayed dry for long enough at a time for my trousers to properly dry out. It was at this point that the walk started to drag a bit. Kirkintilloch seemed further away than we’d expected and we were all starting to get a bit hungry by this time, which may account for the slightly bizarre conversation that ensued. It started off innocently enough, with Chris telling us about one of her plants (she had no idea what it was, but she suspected it might be an African Lily, so she asked an expert who said “well I don’t know what it is but it’s definitely not an African Lily”, so from then on Chris just referred to the plant as “not an African Lily”), but moved into the realms of the weird when Ian mentioned a filing cabinet that had mysteriously appeared in his office at work and told us his theory that it might in fact be an alien from another planet in disguise. After that the effects of the hunger set in even more deeply and we started talking about how anything might in fact be anything else, which at least passed the time until we rounded a corner and reached Townhead Bridge. (Well, I say “bridge”, but at this point in time it was actually just an embankment blocking the canal, with a horrible silted up submerged culvert in the middle. It was to be another six years after our walk before there was an actual bridge there again). Eagerly we climbed up the steps to the main road. We’d been planning to find a fish and chip shop and get something from there, but with the weather having turned unreliable we decided to sit in at the nearby shopping centre’s food court instead (they had fish and chips so we didn’t feel like we were missing out). For some reason we ended up having a bit of an argument about religion, with Ian and I saying it was mostly a negative thing that had caused a lot of wars and so on, while Chris said without it we might not have ended up so civilised. That was what I liked about spending time with Ian and Chris, you could talk to them about anything at all, from plants and filing cabinets right up to big things like the effects of religion on society. (And aliens disguised as filing cabinets). As we returned to the canal with fuller stomachs, I was interested to see that there was a bridge I hadn’t known about next to Townhead “Bridge”. I’d made notes from the Forth and Clyde Canal guidebook in a library since the last walk and ended up memorising the table of bridges and locks in the back (not intentionally, I just found it so interesting that the information stuck in my head without me even having to try! I’m weird like that), but this new concrete flyover wasn’t on the list, so it must have been built after the guidebook was published. It looked a bit out of place, soaring overhead in a big sweeping curve to give lots of headroom over a disused, silted up canal that disappeared under an embankment only a few yards to the west, but I guess they were already planning ahead for the canal’s eventual reopening by the time this road was built. Just beyond the new bridge (“Nicholson Bridge”, I believe it’s actually called) was a more interesting piece of infrastructure: the Luggie Aqueduct, the second biggest one on the canal after the Kelvin. We went down below to have a closer look. 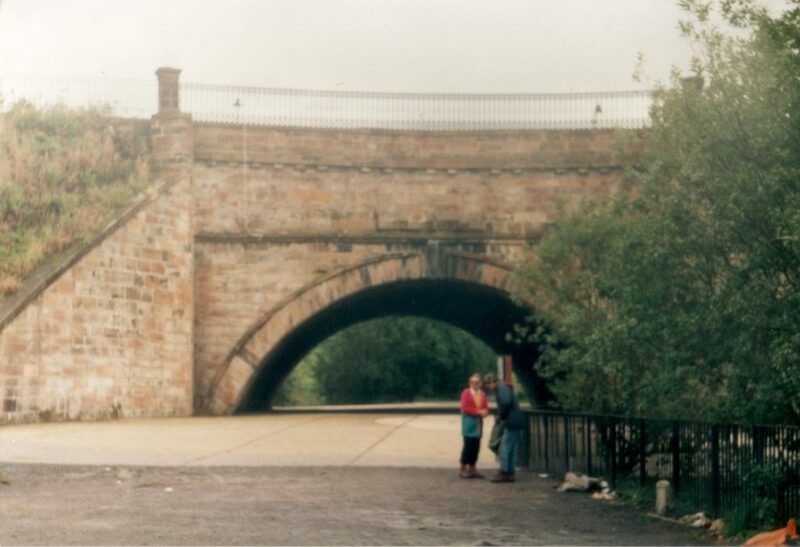 It was just a single arch, but unusually the Luggie Water which it had been built to cross wasn’t visible underneath – that had been culverted under the aqueduct so that a railway line could be built through the arch. The railway line had gone but the path in its place had been resurfaced with railway track patterns in the stone work. I took my fourth and final photo of the day, then we returned to the canal, where there was more rain waiting for us. Pretty soon we were out in the country again, following the canal through open fields, with very few features along the way. The next bridge, Twechar Bridge, was only a few miles east of Kirkintilloch but it seemed to take us ages to get to it. At times the towpath shared its course with a minor road which was harder on the feet and meant we had to be on the lookout for cars. Eventually we started to suspect that the village of Twechar was actually getting further away from us the more we walked towards it. Then it suddenly “appeared” in front of Chris as she tried to unobtrusively relieve herself. She came back to where Ian and I were waiting and reported that she had found it. I was starting to flag by this time. We’d already walked about 14 miles, further than I’d ever walked in one go before, and although the scenery was pleasant enough, there wasn’t really enough canal infrastructure on this section to spur me on to keep going. So when Ian suggested we leave the canal at the next bridge (Auchinstarry) and make our way home from Kilsyth, I agreed. The next suitable stopping point was several miles further on and I wasn’t sure if I could manage that, Dextrosol or no Dextrosol. Kilsyth wasn’t too far away, just a short walk to the north along a B road. When we reached the main street, Ian sprinted across the road in front of a huge lorry to ask a passer by what time the next Falkirk bus was due. (“I thought I was going to collect my insurance money there!” said Chris, grinning, as we followed Ian slightly more carefully). Apparently the bus was due soon after 5pm… that wasn’t too bad, it was nearly 5 already. We settled down on the bench in the bus shelter, glad to take the weight off our weary feet for a few minutes. But it turned out to be a lot longer than a few minutes! 5pm came and went with no sign of the bus. By 5.30pm we were starting to get a little restless, but since it was 1994 and smartphones and bus trackers were yet to be invented, there wasn’t a lot we could do except continue to wait. By 6pm I was starting to wonder whether I would have to live out the rest of my life in this slightly grotty bus shelter, and whether the old woman who kept smiling out of the window of a nearby flat was laughing at us. Finally at twenty past six or so, a bus trundled round the corner. As we heaved ourself onto it, not sure whether to be annoyed at the wait or glad it was here at last, Ian asked what had happened to the 5pm bus. Apparently it had broken down. So much for buses being better than cars. We had to change buses at Falkirk bus station. We had half an hour or so before the Edinburgh bus was due, which meant there was time for Chris and I to make use of a funny looking automatic public loo (quite a novelty in those days), and then for us all to go to a nearby cafe while we waited. Chris and I just had hot drinks, but Ian was hungry and ordered a chip butty. I’d never heard of such a thing before and was quite amazed to find, when it arrived, that it was exactly like its name suggested. I decided I quite liked the look of it and half wished I’d ordered one myself. Despite having had half an hour to spare, we still managed to nearly miss the Edinburgh bus. This was one of the more memorable bus journeys of my life; almost all the other passengers seemed to know each other and the driver and were chatting to each other the whole way, making us feel a bit like we were intruding on some private gathering. The only other person who didn’t appear to be part of this cosy little community was a middle aged man sitting near Ian, Chris and me. He spent most of the journey staring at us and laughing whenever one of us spoke. Luckily I was feeling pretty out of it after my long day and all the fresh air and exercise, so I was happy to just sit there and let it all wash over me. Even so it was a relief when we got off into the comparative sanity of my own neighbourhood. Despite the rain and the travel difficulties, I think I actually enjoyed this walk the most out of the three. It was a nice picturesque stretch of canal and satisfying to walk so much of it in one go.